In response to a legislative mandate by Congress made in 1994, the FRA has at last issued their Final Rule on the Use of Locomotive Horns at Highway-Rail Grade Crossings. 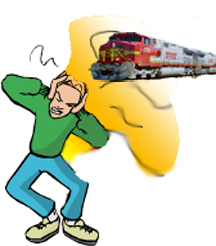 This final rule, which requires that locomotive horns be sounded as a warning to highway users at public highway-rail crossings, will take effect on June 24, 2005. Until June 24, 2005, the sounding of locomotive horns at public crossings will remain subject to applicable State and local laws. The final rule provides an opportunity, not available until now, for thousands of localities nationwide to mitigate the effects of train horn noise by establishing new "quiet zones." The City attorney and the City engineer have been working diligently on completing the requirements in order for the Point Richmond crossings to qualify for the “Quiet Zone” designation. This completion and filing would denote no more horn blowing folks! At last, those annoying horn blasts will stop waking us up, or drowning out our conversations or television programs. The Federal rule pretty much precludes any further state action on anyone’s part to sue the railroads. However, if they are violating the quiet zone areas, they are subject to fines and of course damages if one would file their case in court. We will see how this process will take to completion. In the meantime, Dr. Hagler and I will continue to shepherd this project to completion. The Federal regulations are rather lengthy. If you want to see them, you can either view or download their pdf file at: http://safetydata.fra.dot.gov/officeofsafety/.